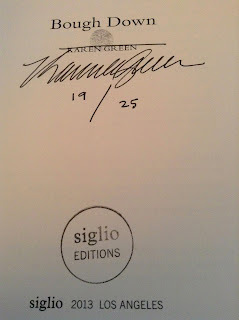 My limited edition copy of Karen Green's Bough Down arrived this weekend. Siglio Press did a great job with this book--I've got a handful of their titles and I've not seen something as text-based as this one. Editorially speaking, they've achieved a great balance between Green's minimal collages and her brief prose-poems. Every ten or so pages, a delicately nuanced collage appears, reprinted no larger that about 2-3 inches per side. Most of the pieces are made from postage stamps, and like any good minimal art they can be unpacked of meaning and subtlety and take on a presence much larger than the physical image. The text to Bough Down is similarly condensed and similarly expansive. An elegiac flow of tight, finely-tuned fragments, Green's Bough Down details her difficulties coping with her husband's suicide in both word and pictures, and is resoundingly successful in both iterations. Some might be interested to know that the late husband at the center of this work is David Foster Wallace, but Green's work both as an artist and a writer absolutely stands up without that name attached. Like Black Sparrow Press did before them, Siglio Press offers very small editions of their books that include original art. As someone who is still searching for a Black Sparrow Press Joe Brainard book with an original drawing in it, I find Siglio Press's limited offerings to be very exciting. 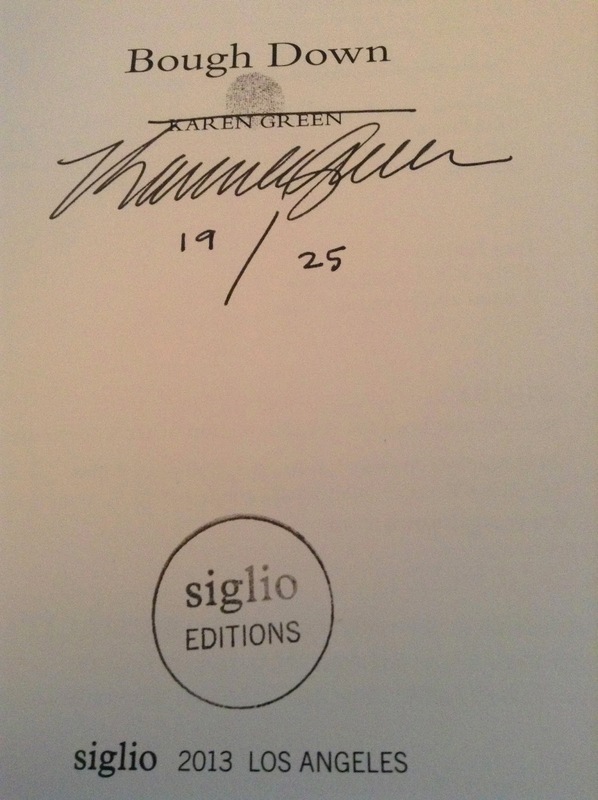 If I did miss out on Black Sparrow's lettered editions (which are now likely all in the locked cabinets of the world's rare book rooms), perhaps Siglio is the answer for me. This is number 19 of 25 signed and numbered copies of Bough Down that includes an original collage in a glassine envelope pasted down on the front endpapers. The cost of the edition rose as the edition sold out and I was very lucky to get in fairly close to the opening price. The run has since sold out. Jozef van Wissem & Jim Jarmusch, "The Mystery of Heaven"